By leadership demand, this book has been reduced in size (from 336 to 202 pages) and "fine-tuned" for business owners. It's been extensively rewritten using the language and tone of the business. It's now easier than ever for your people to apply the principles of No Excuse! I'm Doing It to build the business. 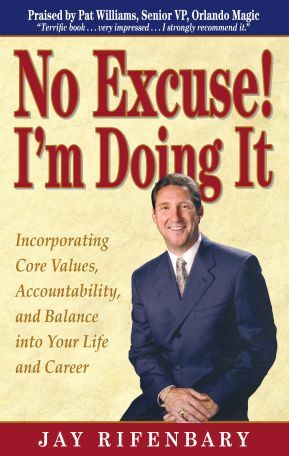 This book helps people to stop making and accepting excuses, and take charge! It will help anyone, from a new "sign-up," to seasoned leaders at all levels. Imagine what could happen when your people start saying, "No Excuse! I'm Doing It" to their leadership! No Excuse! I'm Doing It helps business owners understand that their results, (successes & failures) are simply outcomes of their decisions and actions. They'll learn they're totally responsible for their own future. They'll discover how to overcome their fears and let go of past failures so they can move on and live their dreams. People will learn how to be more productive and inspire others to take action so they can grow. The book promotes "the system" and will accelerate growth for all who apply the "No Excuse!" philosophy and do "whatever-it-takes" to "make-it-happen." Your people will feel Jay's empathy for them and their challenges in growing personally and building the business. No Excuse! I'm Doing It will inspire and motivate, but more importantly, activate! When people develop the "No Excuse! I'm Doing It" attitude, they'll find it's contagious. As it spreads through your organization, great things can happen! When people take total responsibility for their own success and stop making and accepting excuses, their business can really start to blossom.